okay, this tip isn't all-natural, it just works! the other day, i was doing laundry...whites. i didn't bother checking the pockets, because there were no shorts or pants in the load. i DID shake everything before i put it in the washer....just to make sure a red sock wasn't trying to sneak in there. i shut the door and turned the washing machine on. once the load was done washing, i grabbed a handful of clothes and threw it into the dryer. i'd be lying if i said i shook everything to get the wrinkles out. as soon as i reached for the next handful, i got a whiff of something suspicious. it smelled a little minty, but i just blew it off. i shoved everything in the dryer, threw in a softener sheet, and pressed start. the next morning, i remembered the whites were in the dryer. so, as usual, i gave them a fluff on high heat. when they were wrinkle-free and hot, i pulled them out and starting folding the pile of mostly t-shirts. to my surprise, Mr. Fit's expensive dress shirt was mixed in the bunch. i flattened it out, before i hung it on the back of a chair. and, there was that delicious, minty smell! then, i noticed a big, greasy spot (the size of a silver dollar) on the pocket. i opened the pocket, and what do you know...it was gum! this isn't the first time i've dealt with double-mint. i've tried baking soda, ice, vinegar, the freezer, and hairspray to get rid of gum. none of which worked particularly well. i'd also heard of using lighter fluid and gasoline, but that just didn't seem smart. this was not ordinary gum. this gum had been put threw the spin cycle, then had the wonderful opportunity to melt not once but twice! seriously, a sticky situation! i had and idea. Goo Gone! it's great for removing adhesives, stickers, and label off of ceramics and glass, but it leaves a greasy residue. 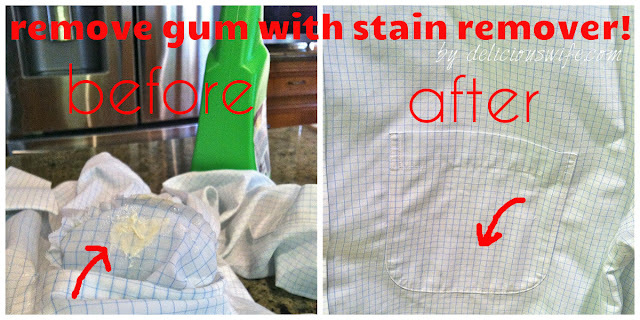 i knew i'd have to use a stain remover afterwards. so, i skipped the Goo Gone and went straight for the Resolve stain remover. not because i'm lazy, but because i'm efficient! i sprayed the gum spot until it was soaked and let it sit for a few minutes. then, i began scratching the gum off with my nails. i even scrubbed each side of the fabric which helped get out the melted candy shell. after about fifteen minutes, the gum was all gone and no sign of a grease spot! i gave it another go in the washer and dryer. and, voila...no sign of a sticky mess and no grease spot! it was good as new!